A memorial service for retired U.S. Air Force Chief Master Sergeant James William Wells, 66, of Dover, Delaware, was held Saturday, March 23 at, Bennie Smith Funeral Home, Dover. Sergeant Wells died of natural causes Thursday, March 14, 2002, in his home. 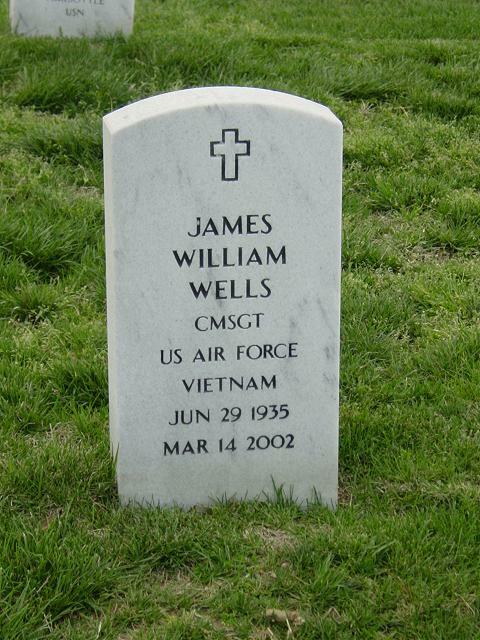 Sergeant Wells was born June 29, 1935, son of the late James G. Wells and Ruth R. Wells of Ambler, Pennsylvania. He attended Ambler High School, graduating in 1953. Wells enlisted in the U.S. Air Force in 1957. While in the service, he received numerous decorations and awards, including the Bronze Star Medal, the Meritorious Service Medal, the Presidential Unit Citation and the Republic of Vietnam Campaign Medal. Upon retiring from the Air Force in 1985 with the rank of Chief Master Sergeant, he was employed at Metal Masters, Smyrna. He was an avid sports fan and enjoyed cooking. Sergeant Wells was a member of Masonic Lodge 28, where he once served as a past master and as a special assistant to the grandmaster of Delaware. In addition to his parents, he was preceded in death by his wife, Carrie D. Wells. Columbus, Ohio; a host of other relatives and friends; and his beloved friend, Georgianna Crapper, of Dover. Burial will be at 1 p.m. Thursday, March 28, in Arlington National Cemetery, Arlington, Virginia.